It has been a long time since I worked on this one. so I left the box on my cutting table. Then late yesterday, when like many others I am sure, I found myself laying under the Air Conditioner doing nothing. Well I don't do the "doing nothing " to well. It makes my grumpy! So I went and grabbed the box. I have a weather App on my Ipad so snapped this pic with it and posted to Instagram. 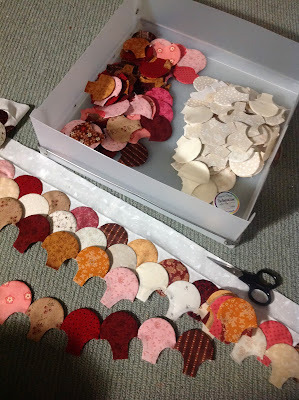 By 11pm, I was on the floor (still under the Air conditioner vent) laying out my clam shells. Tennis is good for keeping me company this time of year as everyone else was in bed. Also ........ I have been getting things ready for Miss Lily to start school. So yesterday morning I turned her boring black reader bag and Art smock from this ..... to this. No mistaking who they belong to now. Oh and my new toy. Never thought an Iron could make me so happy but this one does. Hope you find time today to do something that makes you happy. Such pretty fabrics for this quilt. Always been intrigued as to how you attach those clam shells. It's far too hot. Going to be at the beach in one hr. Just enjoying coffee whilst kids eat break key. I must get my Lily ready for school too but will wait for next week when it is hopefully cooler. Sorry but forgot to ask if that iron is the one Camille has in her craftsy class? Looks amazing. Is it the one you can just push down on? Aren't these irons amazing, your clam shells look so pretty. 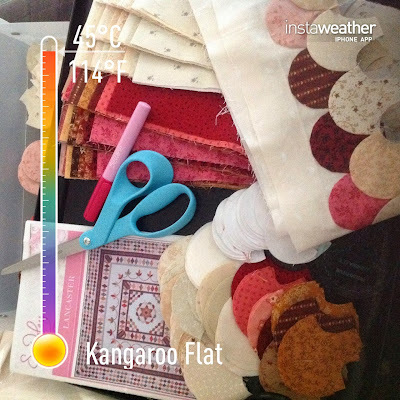 Keep cool today and enjoy your sewing. It is lovely to rediscover a project. With the forecast we have you should make a lot of progress this week. The library bag and art smock look lovely. Love the clam shells but haven't yet done any myself. I don't have air con so I was a bit cranky not being able to stitch but I did manzge to sort through some scaps, wash and dry fabrics and put free internet patterns in sleeves. Enjoy you air con. Grandma/Nannas come in handy!!!! 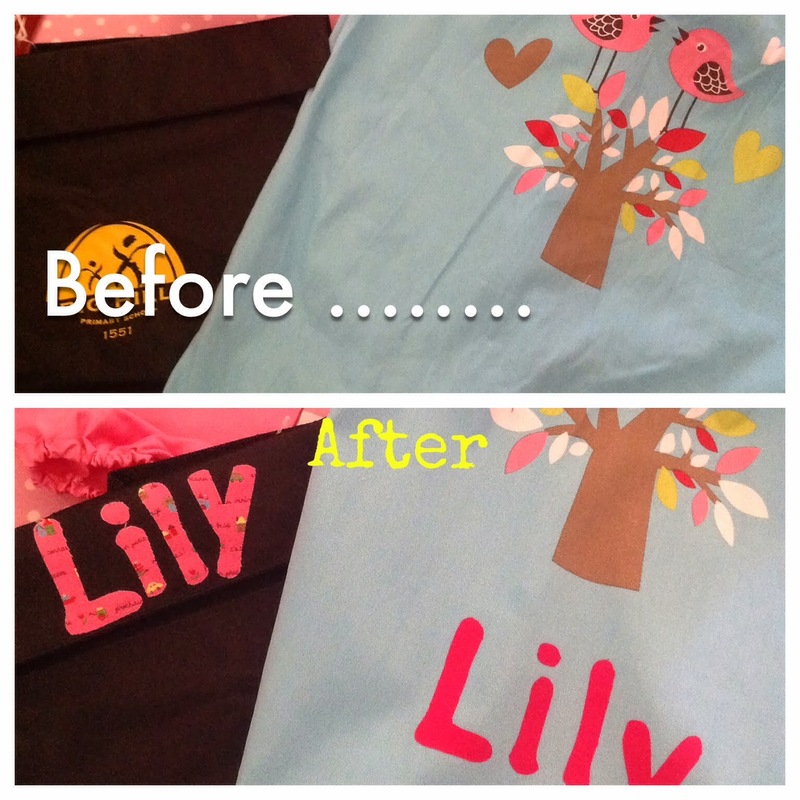 I've just finished a library bag & putting finishing touches to Miss Bethanys art smock for start of school. I'm forever grateful we have an airconditioner, even if it is from the 1970's. It works like a charm but fingers crossed it stays that way as we're not finished with the heat here in Adelaide yet. 45 today and 46 tomorrow. Looking forward to Friday when it will be cooler, only 40! I have seen those irons but have heard they have a reliability issue. 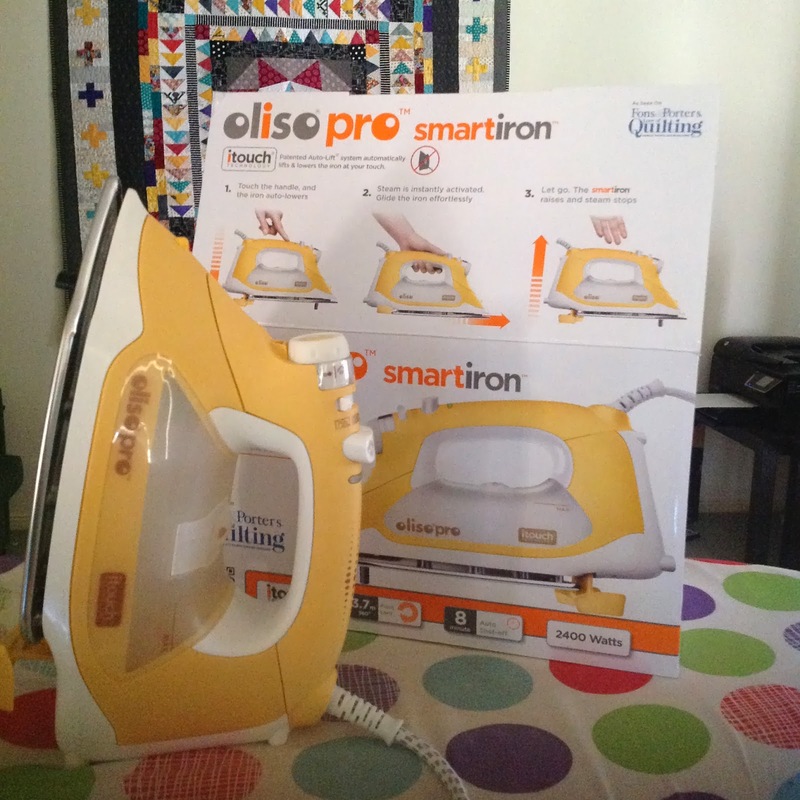 I will be interested to hear how it goes over time as I have yet to find an iron I like (that may be because I hate the ironing and therefore the iron!). Keep cool! Great iron - love yellow. So looking forward to seeing your clamshell borders together. Miss Lily will have the best looking school supplies. Love the clam shells and how happy will your gorgeous girl be at school with her beautiful goodies from her mum. Clam shells are very pretty,love the fabrics used. When miss Lily gets to school all the other mums are going to want their kids things being labelled ,be prepared, haha. Ps freezing here and very wet.